Here’s a little “off site” seasonal Buried Treasure for you, another Valentine’s Day project that just might spark creative ideas beyond Valentine’s Day. I found the intertwined hearts a little challenging to visualize but I kept practicing Carole’s example to get the hang of it. BTW for those who aren’t familiar, Carole is the creator and publisher of the Tangle*A*Day Calendar. She’s been publishing it annually for quite a few years – you will find the link to get a copy of the 2019 calendar in the sidebar of her site. It’s a fun way to chronicle your tangling journey. And TanglePatterns.com automatically provides a new entry idea 3 days a week! 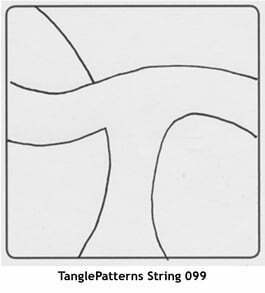 Many tanglers like to use these biweekly Tangle Refreshers as their Zentangle® challenge-of-the-day. Using the RANDOM TANGLE SELECTOR in the left sidebar this TanglePatterns String was selected for today – either to go with today’s Buried Treasure or just to use as a starting point for your day’s tangling. Think of this as your tangle Challenge, if you’re so inclined. TanglePatterns String 099 is from CZT Jane Dickinson and was originally posted here. Right click and SAVE to your computer; then print. Pinning content from this site is not permitted. Copyright notice is posted on the bottom of every page. Thank you for respecting these rights. To download eBooks containing all 250 TanglePatterns Strings, visit the STORE > EBOOKS page. A great companion to the Kit is the Zentangle Primer Vol 1 – your CZT-in-a-book by the founders of Zentangle! Now available in softcover. I just want to thank you. I stumbled across your site in the midst of an incredibly challenging time in my life— and realized that, if I could just accomplish this one thing- one tangle time a day— it would be SOMETHING. And that would be enough. I am grateful. Thanks for your thanks 🙂 Michelle, delighted to have you with us. We are all grateful for the gift of Zentangle in our lives and it is a special blessing for me when tanglers share that TanglePatterns has helped contribute to their well-being. It makes my day.